Jamaican sprinter Usain Bolt has gained worldwide acclaim this week, by shattering not one, but two, world records. The 22-year-old ran the 100-meter race in 9.69 seconds on Aug. 16, celebrating his way across the finish line in what appeared to be a fun and relatively effortless pace. Wow! Then, yesterday (Aug. 20), he Bolted across the finish line in the 200-meter race in 19.3 seconds to claim that record. I'm sure his name has nothing to do with it. When I did my first triathlon in 2003, the last finisher in that event had the last name, "Allpass." I'm sure her name had nothing to do with it. Romanian Constantina Tomescu-Dita ran for the Gold Sunday in the Women's Marathon at the Olympics in Beijing. The 38-year-old finished in 2:26:44, twenty-two seconds ahead of silver medalist Catherine Ndereba of Kenya and 23 seconds ahead of Chou Chunxiu, who earned the bronze at home in China. Click here for the full story on Yahoo!Sports. 2004 Bronze-medalist Deena Kastor, the would-be top contender for Team USA, pulled out of the race shortly after the three-mile mark when, apparently, she "heard something pop" and realized she had just sustained a broken bone in her right foot. “As athletes, we have ups and downs,” she is quoted in the above-linked Yahoo! article. “Unfortunately, you can’t pick the days they come on." Now, that's the winning spirit I like to see. Can't say so much for some of the other Olympic contenders this time around, huh? 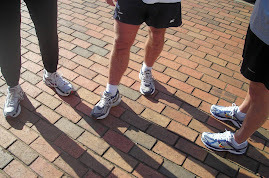 The Men's Marathon is scheduled for this Sunday, Aug. 23. The HiWaay Sprint Triathlon (3-mile run/6-mile bike/600-meter swim) took place in Huntsville on Saturday with Athens' own Heather Robinson dominating her age group, with an overall finish time of 57:20. Wow! Robinson, 33, finished 1 minute, 34 seconds ahead of the second-place 30-34 female and a full three minutes and then some ahead of the third finisher in that division. Again, Wow! Here's Heather, below, at right, approaching the finish line in the 2006 Duck & Run 5K in Athens. Take note, this year's Duck & Run is slated for Sept. 20. Click here for a registration form. And though she is not among the Limestone Countians I usually recognize here, I'm also going to shine the Wow!-Spotlight today on Madison's Madelyn Patton, 45, who finished in a whistlingly impressive 54:17, taking the first-place award in her age division. 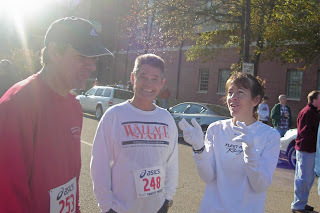 Here's Madelyn, below, at right, goofing around with Glen King & Philip Stewart at Decatur's Frosty Freeze 5K in December 2007. For complete results from the HiWaay Sprint Triathlon, a Huntsville Track Club event, visit the HTC Website or click here to go directly to the age-group results.